Ducted air conditioning is the best way to keep your whole home or office building at the perfect temperature. Ducted air conditioning is practically invisible, can heat as well as cool, and is so quiet you’ll hardly know it’s there. Indoor unit: (installed in your roof) to send the cool (or warmed) air to each of the vents. 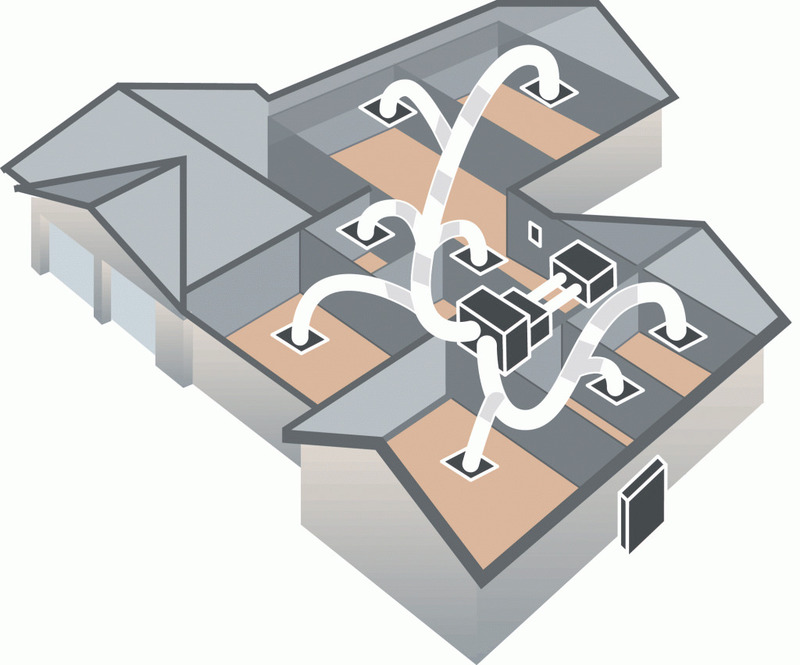 Ducting: a series of ductwork, vents and grills to transport the air to each room in the building. Outdoor unit: (attached to the exterior of the building) to send away the hot air. Controller: to set the room temperature, air flow speed, zones, and timer options. Ducted air conditioning is so sophisticated you can create different zones in the building; making some warmer, some cooler and having them turn on or off at different times. All of this is done from the smart controller. Let’s say you work from home out of an upstairs office. By creating zones, you can have the air conditioning turned off in the remainder of the house. 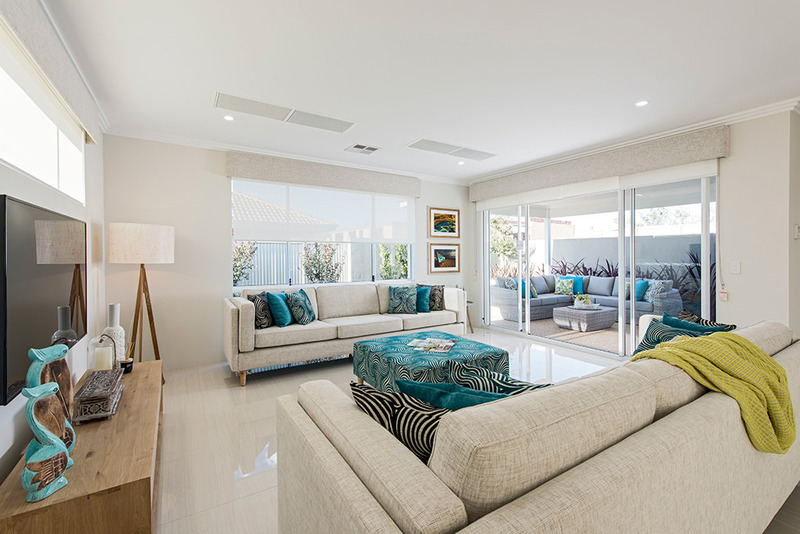 Then when the kids are due home from school you can turn on the downstairs living area or their bedrooms. Alternately in your office space you might only send cool air to the meeting room when it’s being used, and turn off different offices when staff are out in the field or away on leave. Some of our ducted air conditioning systems are controlled using WIFI and your smartphone: so you can control the entire system even when you’re out. It’s flexible, you have complete control, and it saves you money. Coolmax has been installing ducted air conditioning to businesses and private residences across Sydney for more than 10 years. We work with leading brands: Daikin, Fujitsu, Samsung, Mitsubishi Electric, Panasonic, and Acron Air. Choose the one you love best. We visit your Sydney-based home or business, and we listen. We’ll get to know your personal or professional needs, and make recommendations based on the brands your like as well as your budget. Because ducted air conditioning requires careful planning and attention to detail we spend time measuring the building, taking into account the construction type, ceiling cavity and outdoor environment. We also examine your building plans so we can make the best recommendation for your property. When we’re done you’ll receive a written quote, with transparent pricing and a full description of what we’ll be doing. You’ll know exactly what it costs, where each unit will be located, and the positioning of each of the grills and sensors. Correct positioning is essential for efficient, energy saving performance. We’re so happy you loved our quote. Now it’s time to install your new ducted air conditioning system. We provide a full 12 month warranty on the installation. We’ll arrange a time that works for you and ask you prepare to have us in your home or office for up to two days for the complete installation. Remember that the installation process can be noisy (and dusty) and we’ll be accessing all areas of your home or the office building. So you might consider a little holiday for your pets, small children, electronic gadgets or treasured artworks. An essential part of installation is testing the ducted air conditioning system thoroughly. We make sure everything works seamlessly as well as meets all the Australian safety standards. And before we leave we’ll explain fully how to use your new system and maximise its efficiency. PS: We’ll also clean up after ourselves and leave your home or office the way we found it. Maybe even a little bit better. We also carry out any warranty repairs (remember you’ve got 5 whole year’s manufacturer’s warranty on both the indoor and outdoor units) as well as a full 12 months warranty on the installation. Does all this sound great? Just get in touch with our professional team here at Coolmax in Sydney. Fill our the contact form by clicking here or phone us on 0412 434 704. Our service area covers most of the greater Sydney area including Richmond, the northern beaches and Campbelltown. Call today.